It’s Good Friday, so it’s time to talk about the new Good Victory Condition! This is called the Unifier Victory, and will be available in the upcoming Eternal Lords expansion. Many new systems come together in this new victory condition. Previously we explained that we’ve introduced alternate ways of expansion, through investing money in strengthening relations with the world around you, relations that are now tracked per race. Declaring war on an Indy city will damage relations with the race that owns that city, as will migrating or razing a city. High Race Relations, means Independent Towns of that race will like you better and even Enemy Towns might turn on their owners and join you by sending a Liberation Quest. Loyal Vassals provide steady income and can provide support in time of need. Peace Keepers with high race relations can trigger towns to turn on their less benevolent masters. High Race Relations also means you will gain Race Experience at a quicker rate, meaning you will gain Race Governance upgrades for your people faster. So where does all of this lead? You still have enemies to defeat, after all. Military force is always an option – a peace keeper’s happy economy can field a big army. But Eternal Lords introduces an alternate route: The Unifier Victrory Condition. When the Unifier Victory is enabled in the Map Setup Screen, and once Level 3 Race Governance of a particular race is reached, the construction of the Unifier Beacon is unlocked in cities of that race. Building Beacons is expensive, but a late game metropolis has no trouble producing one in a reasonable amount of time. This beacon sends the message to the entire world that you are the benevolent leader destined to unite all races in a harmonious empire. The construction is a two-step process; first you construct the tower, costing a ton of gold and then you light the beacon, costing a ton of mana. Each steps send a strong message to the people of the other realms, creating unrest by applying a penalty to the happiness of your enemies cities and units, while you gain a bonus to yours. See, you’re destined to Unify the world! … but not everybody agrees! Of course the other leaders are notified when the construction of the Beacon Commences, so prepare yourself to be attacked. Using the default settings, players need to build Beacons in cities of two races, but this can be changed pending player’s preferences. Of course more Beacons will take longer to obtain as you’ll need to up the Race Governance for each race. A handy Overview lists the status of Beacons for all players. The Unifier Victory condition is a great option for more defensive players, it provides an alternate route to winning the gamethan pure conquest. Leaders with Creation Magic, the new Keeper of the Peace Specialization and even Rogues and Theocrat have skills that work well with this play style, helping to raise happiness and relations with independent towns. Next week we’ll have a new video where we will show this play style in action! You’ve Won. May there be peace, love and happiness! This topic contains 45 replies, has 30 voices, and was last updated by Ravenholme 4 years ago. Mr. Tigran doesn’t look too happy about winning. Too much pressure? Looking forward to this too! I get to build more things! Everywhere! Hah! Yes, my one hope for this was that the city in which you constructed the tower would graphically get the tower, like the class structures, and that does indeed appear to be the case – awesome. This reminds me a lot of the Spell of Mastery from Master of Magic, only there every AI would gang up on the one starting to cast it. Will the AI’s you’re not at war with (no enemy penalty) start breaking peace when you construct Beacons or can they choose to offer alliances instead (depending on relations)? Would allies share your huge Base Empire happiness bonus during Unification? The lack of a victory condition that didn’t involve brute force was one of my main gripes with the game, and now that’s been solved. AoW3 has come a really long way since vanilla. Well done, Triumph. Good work. I would like to see how “shadowborn” players can aquire victory, since peacekeeper seems to be the best specialization from all those three, new specializations in eternal lords. An article about shadowborn, pls. This is a victory condition that can be turned on/off, I hope, and not unalterable? Thanks for that one – and well implemented. An article about shadowborn, pls. yes, you can turn it off, like the seals. What do you mean by not unalterable? I’m going on the assumption that Shadowborn are built for good old fashioned violence and destruction, which means they already have a victory condition. I wouldn’t say no to another one, but I feel like they’ll be just fine. The scope of this patch is honestly dizzying at this point. I will say I have never ever seen an expansion with so much in it, and which changes the game in so many ways. There really needs to be a whole flurry of new reviews once this is out. I know everyone wants more expansions after this, as do I and I would happily pay for more, but I don’t think it would be neccesary for me to enjoy the game for years to come because there is already so much in it. Inevitably there will need to be a tweaking of balance changes after the game has been out a few months, and hopefully something done to make underground a more desirable RMG element, but otherwise its just an amazing amount of content that should keep any strategy gamer happy for a long time. 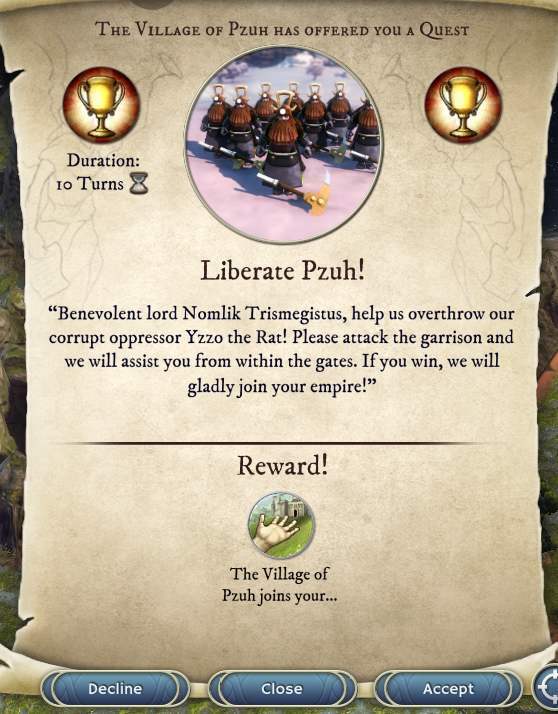 One question about the village of “pzuh” above…is this something that will happen to vassals, or to towns directly under the control of someone, or both? Actually at two races I think Shadow Born have the advantage, they can afford to migrate all thier cities to two races, yeah they take a massive hit with other races,but they only need two. At higher, say 4 beacons or more, then Peacekeeper has the advantage. Lennart also forgot that Expander would be very useful in this play style, faster expansion of the population of you cities will boost your race relations, and faster moving settlers means more cities of various races which will help you expand your empire. Will the Unifyer Victory Condition be also introduced to vanila game (without any DLC) as Seals of Power once were? IIRC it can happen to both, but Vassals just decide on their own, if they don’t like you enough anymore, so usually they’ll just split apart by their own. I can see people building these beacons not to win the unifier victory condition, but for the sake of economic warfare, boost your economy, while disupting an enemies economy. I think each races beacon should have a unique effect, unique to that race. BTW what happened to the Reef Colony Dwelling blog post? Guess it got moved to next week. Shadowborn would be intent on Breaking Seals of Power (To weaken the barrier between Athla and the Shadow Realm) and, yes, good old-fashioned violence. I also think each race should have a unique racial wonder of the world type thing, not connected with unifier, just a thought that occurred to me. So now the methods of winning are out right conquest, forcing enemies to surrender, taking just the capital and leader of your enemies, making an alliance with everyone (I think you can make an alliance with your final enemy, not sure), Seals victory, and now unifier victory. All this game needs to be perfect in my opinion is shadow demon race,and treants and feary dragons xd.Thank you Triumph for this game ^^. This will make for a nice alternative win condition from time to time, to change things up. An inadvertent double post gives me a chance to second that, lol. The stress of tending to whiny halflings and belligerent orcs can sometimes be a little too much. This is great and I’m glad it wasn’t available at release else I wouldn’t been able to get rid of my usual builder/pacifist playstyle which sometimes takes so much control of me that I’m unable to wage wars properly. Now I first waged wars and I have to adept to a peaceful win option. For xl maps setting the nr of beacons to a higher number is obvious I guess. It looks interesting. The unifer victory condition broadens gameplay and ways to achive victory which is greatly needed in AOW. would that be a 300 happiness penalty to enemies too? that could be pretty strong even if you arent going for unifier victory. dwarves could have a really nice misty dining hall for a massive happiness boost. Well, I would be in the same position if I tried to bring union, and peace, and love, and joy, and then everyone wanted my head in a stake. Especially when Mr. Sootball also wants his minions to eat my brains.